We are pleased to announce Olena Derevianko from Ukraine as the October FLEX Student of the Month! Olena’s placement organization is World Link. 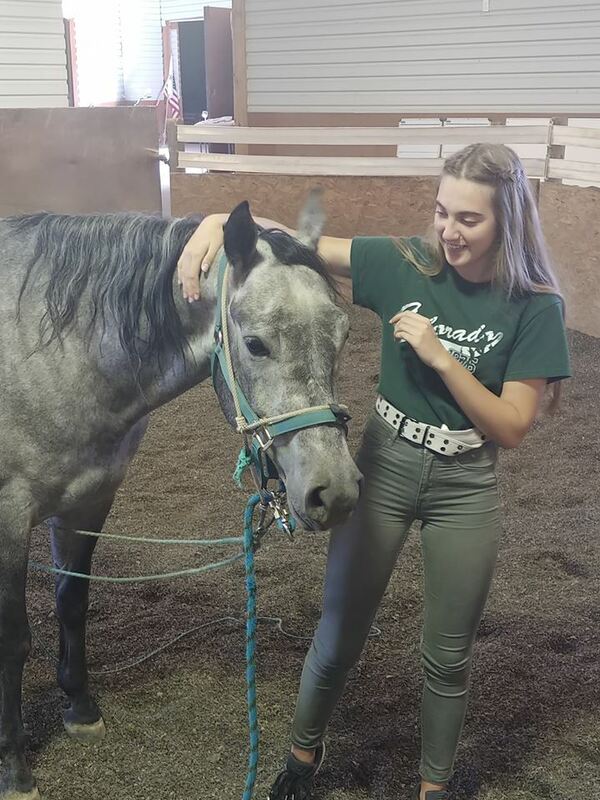 Although the academic year has only just begun for Olena, she has already volunteered over 30 hours at Horseback Miracles. This remarkable non-profit provides a unique program to help youth who are mentally and/or neuro-developmentally delayed increase their ability to learn and function through horseback activities. From her first day, Olena deeply connected with the organization and its mission. The founder, Terry Draper, says Olena is a hard worker and willing to help in any way she can. Though she had no previous experience, she has already trained two new horses to do different therapy exercises. Olena says all the effort in training the horses pays off because she sees the joy and happiness they bring to each child’s life. Olena also volunteers in other ways. Her host mom taught her to knit and together they have been making winter hats for cancer patients. Olena enthusiastically volunteers with the non-profit, Highpointe Services. Another recent activity Olena enjoyed was volunteering at an “Imagination Zone” at an art festival, where she met many community members. At school, while maintaining straight A’s, Olena organizes upcoming projects with Interact and FBLA clubs. She also looks forward to joining more clubs and sports in the future. Olena has an energetic and spirited personality that shines when she’s helping others, making American friends, engaging with her community, and hiking with her host family on the weekends. From a young age, Olena has had two dreams: to come to America and to live on a ranch and train horses. She wrote, "I couldn’t believe that both of my dreams of childhood came true at the same time. It was unbelievable to me and this is how I realized that if you really want something, even if it is deep, deep hidden in your heart, all of the universe helps you with it."